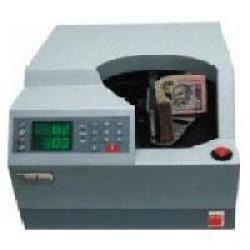 We provide our clients with quality Bundle Note Counting Machines that are ideal for counting the large amount of currency notes. These machines are compact & thus, easy to move. Our product is easy to operate and offers effective performance by accurately counting the notes. We are an eminent firm affianced in distributing, wholesaling, trading and supplying an extensive range of Note Counting Machine which is use for binding A4 paper sheets the offered counting machines are broadly valued among customers for its flawless range. Our counting machines are precisely designed at vendors manufacturing unit employing high end technology. Moreover, we supply these counting machines from our end after conducting a strict test so as to deliver a flawless range. Looking for Bundle Note Counting Machine ?